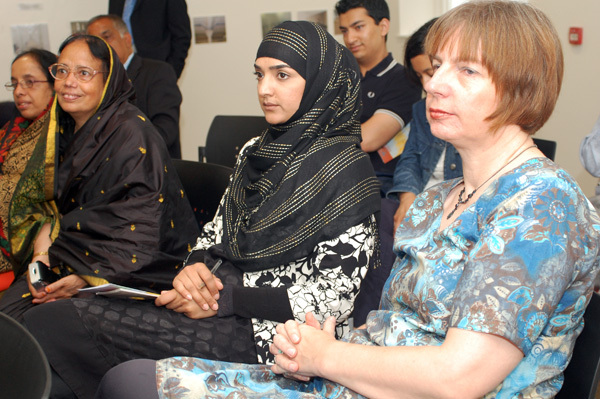 The Swadhinata Trust's launch event for Tower Hamlets 2000 Other Peoples' Houses was a multimedia club night created for and with young people. Click on 'Party' to see what a success it was. Incorporated into the night were the collaborative performances created by young people working with Asian Dub Foundation Education, poet Joyoti Grech and visual jockey Coco. Click on 'Workshops' for more. The performances, which reflected the young Bengali participants' hopes, fears and aspirations about growing up in Britain today, amalgamated spoken word with visuals and live sound. To see examples of the poems please go to the poem page. 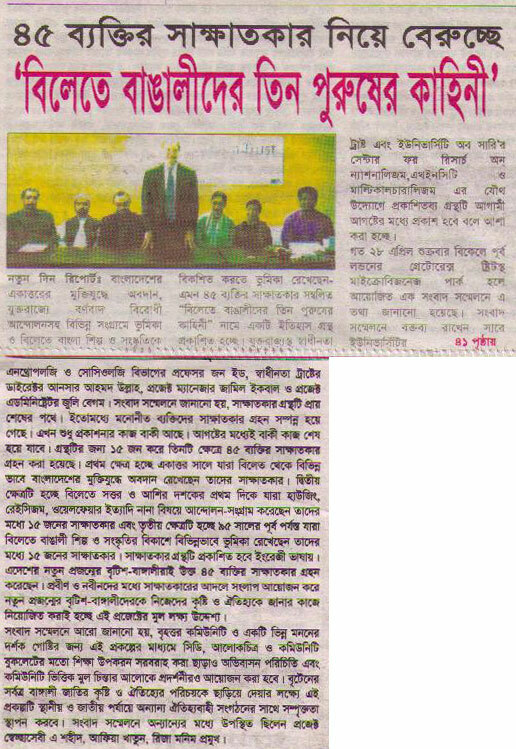 At present Swadhinata Trust is busy preparing the next edition of its magazine 'Bengali Info'. If you are interested in contributing, please click on 'Magazine' in the menu panel. There are plans for further events and activities click on 'Plans' to find out more. 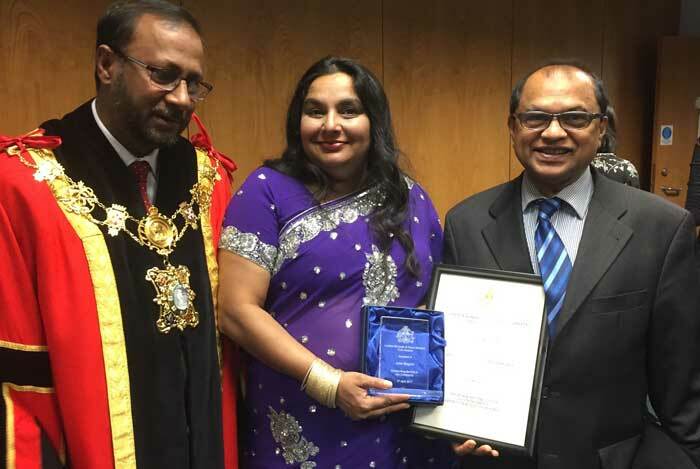 The Bengali Heritage Trail around Tower Hamlets will unlock the history of Britain’s first Bengali settlers, seamen known as Lascars, and will connect key landmarks such as the docks and buildings associated with the seamen who served on British naval and merchant ships from the 17th century onwards. The trail will be described in a booklet made available and online and at a special exhibition and seminar. The research project will explore the history of the Lascars who were recruited in India to work for the East India Company. The trail will take in the sites of East India House and Calcutta House, East India Dock in Blackwall, and Seaman’s Lodgings. It will also include buildings resulting from the settlement of the Bengali Community, including the Brick Lane Mosque and the Kobi Nazrul Centre; and memorials such as the Altab Ali Arch and the Shahid Minar monument. The project will offer unique opportunity for young people to research, document and celebrate Bengali history and heritage by producing the heritage trail. The young people involved with this project will learn about their community’s heritage, acquire skills in research, photography, uploading website, publication and furthermore will pass on this knowledge to other young people. The project will work in consultation with Tower Hamlets Local History Library, London Metropolitan University and the Bishopsgate Institute. The project started in November 2008 and will be completed in August 2010. The Bengali Heritage Trail around Tower Hamlets unlocks the history of Britain’s first Bengali settlers, seamen known as Lascars, and connects key landmarks such as the docks and buildings associated with the seamen who served on British naval and merchant ships from the 17th century onwards. 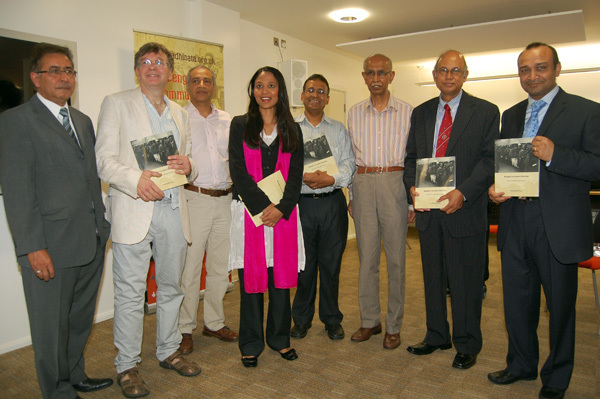 The exhibition is linked to a book titled ‘Bengalis in London’s East End’. ‘The Lascars were recruited in India to work for the East India Company. The trail covers the sites of East India House, Calcutta House, East India Dock in Blackwall, and the Seaman’s Lodgings. It also includes buildings resulting from the settlement of the Bengali Community, including the Brick Lane Mosque and the Kobi Nazrul Centre; and memorials such as the Altab Ali Arch and the Shahid Minar monument. 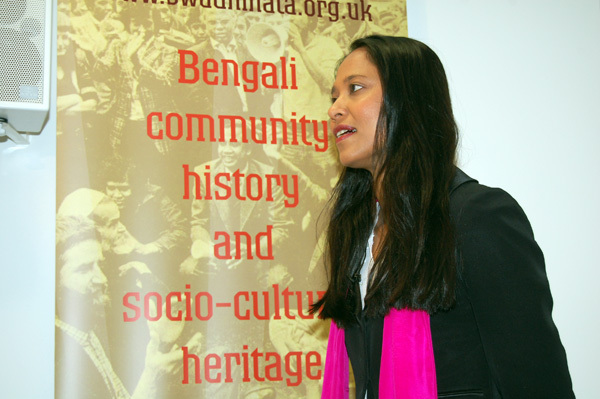 It is commonly believed that the Bengali presence in the UK is something relatively new, at its earliest, from the years following the Second World War. In fact, this is very far from the case. The connection goes back over 400 years, right to the beginnings of British involvement in India. Much of what we know of this history comes from the India Office Records. Books, periodicals and photographic collections add to this wealth of information, as do the personal papers of both British officials and Indian personalities of the time. Although some early Bengali migrants to Britain were servants, most were sailors recruited in India to work on merchant ships. The majority of Bengali seamen came from Sylhet, but others came from Chittagong and Noakhali. Their presence was noticed as early as 1765, when an Indian visitor to Britain wrote, ‘The English were not unacquainted with [men from] Chatgaon (present day Chittagong) and Juhangeernuggur (Jahangir Nagar present-day Dhaka). 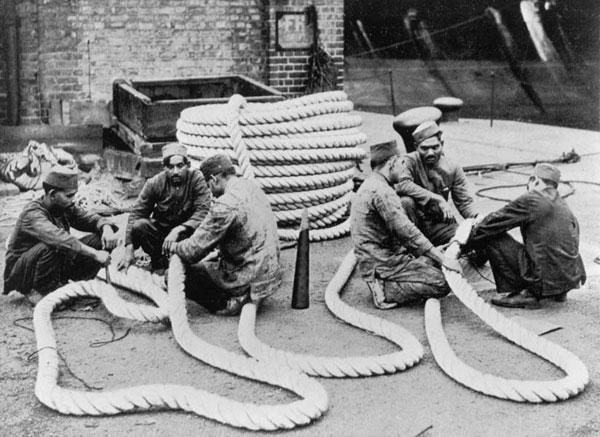 Over the years, the community grew slowly, and by the beginning of the 20th century, groups of seamen and ex-soldiers, including a number of Bengalis, had settled near the docks of East End of London, Cable St and the Shadwell area. They joined the small number of Asian professionals mainly doctors, businessmen and lawyers who had established themselves in Britain from the middle of the 19th century. Among the settlers who arrived in the East End in the 1950s was Syed Abdul Kadir, who now lives in Poplar. He served in the Pakistan Navy from 1950 for twenty two years before retiring as a marine engineer in 1972. He came to the UK in 1953 to attend the Queen’s coronation at Westminster Abbey as guard of honour of the Pakistan Naval ship, PNS Zulfiquar. During Pakistan’s war with India in 1965 he was in active service. During Bangladesh’s Liberation War in 1971 he escaped West Pakistan to fight with Bengali freedom fighters. Sea Captain Shiv Banerjee came to the UK in 1967, arriving at Tilbury Docks, as a cadet with the India Steamship Company. He then sailed around different parts of the world as an Officer in the Merchant Navy. In 1975 he studied at the School of Navigation which is now the London Metropolitan University site at Tower Gateway. The pictures also show his Master’s Certificate and Seaman’s Identity Card part of which is in Bengali. In the early days he lived at Beacon House, Dock Street – then, a seaman’s hostel. The earliest Bengali political activism in London’s East End can be traced to the first Bengali settlers – the seafarers (lascars) recruited in British India to work for the East India Company. The needs of this early community were at least partially met by the earliest charitable organisations such as the Society for the Protection of Asian Sailors in 1857. 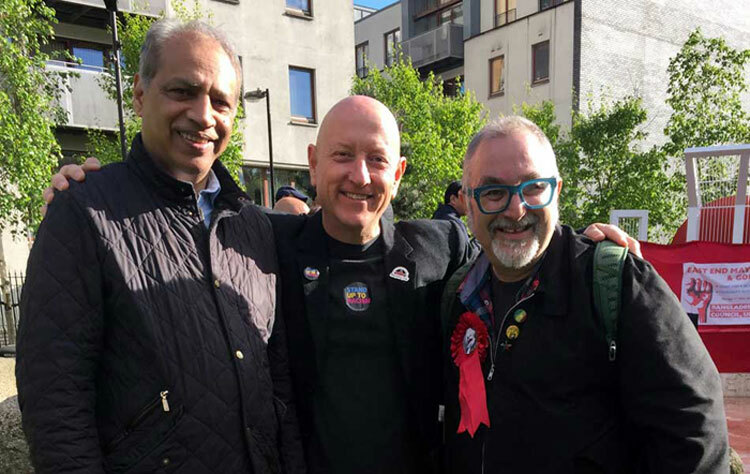 The more recent history of the Bengali community and political activism in London’s East End is very much a story of the community taking matters into its own hands. This started with localised welfare politics, and was later characterised by support for Bangladesh’s national independence movement. 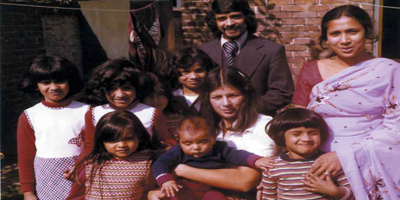 The second generation of Bengali community activists moved into anti-racist politics, campaigning round community issues such as housing and education, political mobilisation in mainstream politics and the global politics of the anti-war movement. Kolkata (Calcutta) was founded by Job Charnock, an English sailor, who settled in a Bengali village 240km up the river Hooghly in 1687. It soon became an East India Company trading post and fort, and grew into a great port city, from where the Bengali seamen mostly sailed. They were the forebears of today’s East End Bengali community. At first The East India Company shipped thousandsof tonnes of tea to Britain from China. In 1824, Robert and Charles Bruce, two brothers from Scotland, discovered wild tea growing in Assam. However, it was not immediately recognised as such: the curator of the Botanical Gardens, a medical doctor called Nathan Wolff thought it was another member of the Camellia family. It was not until 1835 that he accepted it was tea. In 1840, a tea garden was established in Chittagong. By 1855, wild tea plants were also discovered at Chandkhani Hills of Sylhet in Bangladesh. The first commercial tea garden in Bangladesh was, however, established in 1857 at Malnicherra Tea Estate, two miles away from Sylhet town. Immigrants settled in the East End of London, close to the Brick Lane – Banglatown area, because living costs there were relatively cheap, while job prospects made the area particularly attractive. The first big wave of immigration was from France in the late 1500s, with the French Huguenot Protestants fleeing persecution. (The word ‘refugee’ entered the English language at this time.) Both as a result of prosperity and poverty (when imports from India among other places shrank demand for their textiles), they moved to other parts of the UK. However they were followed by other waves of immigrants: the Irish escaping during the great ‘potato famine’ of the 1840s, the Jews from Eastern Europe in the late nineteenth century. ‘Banglatown’ is now the official name for Brick Lane and the surrounding area. This happened in 1997, after a campaign among local community activists aimed at getting recognition for the largest Bengali settlement in the UK. 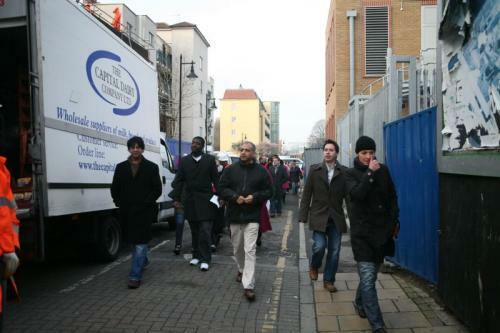 In 2001, the electoral ward of Spitalfields was renamed as Spitalfields and Banglatown Ward. Shahid Minar (Martyr’s Monument) is in Altab Ali Park. It is an abstract work of art – a white structure representing a mother protecting her children in front of a rising crimson sun erected in 1999. This is a locally-made replica of a larger memorial in Dhaka, Bangladesh, which commemorates the ‘Language Martyrs’ shot dead by the Pakistani Police on the 21st February, 1952 during a protest against the imposition of Urdu as Pakistan’s state language. In February 1999, the United Nations declared February 21 World Mother Language Day. 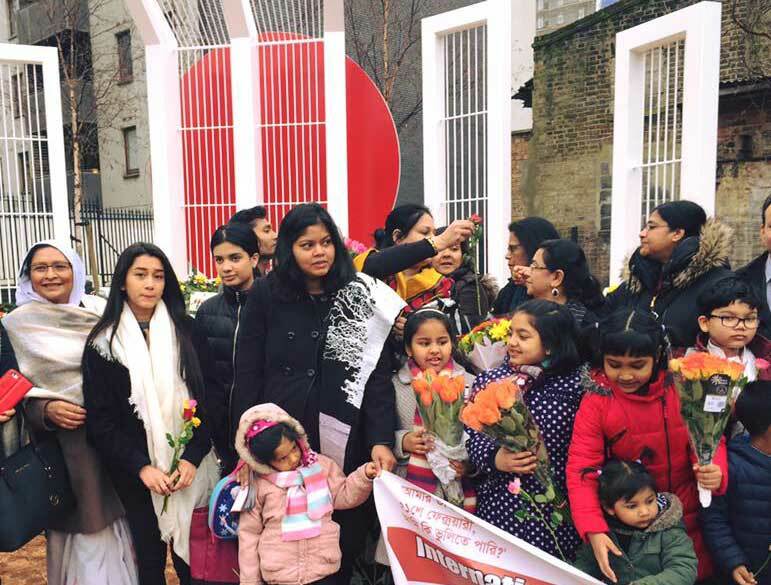 At midnight on the 20th February (Shahid Dibosh) the martyrs of the Language Movement are remembered in a solemn ceremony in the Park, and the Bengali community comes to lay wreaths. Abdul Gaffar Choudhury, a journalist and freeman of Tower Hamlets, wrote a Martyr’s Day song, Amar bhaier rokte rangano Ekushe February. The rise of South Asian music started in the 1970s when Biddu, Steve Coe and Sheila Chandra rose to prominence. However, it was not until the late 1980s that British Asian youth first started to create a new musical genre by combining dance music with the music of their parents’ generation. The youth were growing up in an environment of racial violence and political struggle for self-identity while drawing strength from street culture and their Asian roots. They took pride in their music as they could claim it as their own neither white nor music imported from the Indian sub-continent. The artists who emerged from this period became some of the most successful Asian artists in Britain. They included the Asian Dub Foundation, Joi, State of Bengal and Osmani Soundz amongst others. Heritage Lottery Fund for providing funds. Bishopsgate Institute for providing part funding, research and logistics support. 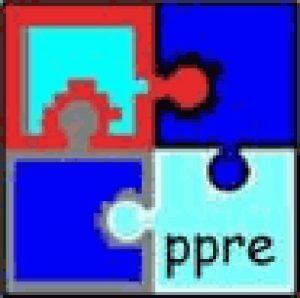 ppre and the London Metropolitan University for providing training, supervision and general support throughout. Claire Renard, Grants Assistant, London Team, Heritage Lottery Fund. Cath Richardson, Grants Assistant, London Team, Heritage Lottery Fund. Dilip Roy, General Secretary, Hindu Temple in Rhondda Grove. 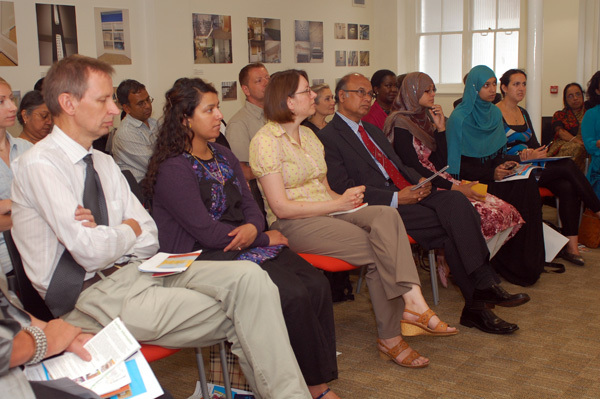 Nighat Taimuri, Development Officer, Heritage Lottery Fund. 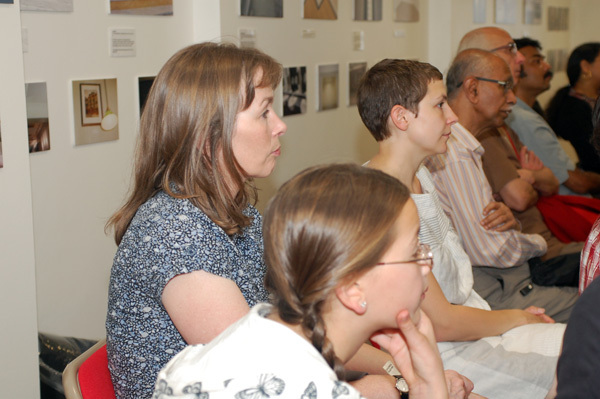 Peter Ashan, Learning and Outreach Officer, Waltham Forest Council’s Museum, Gallery and Archives Service. 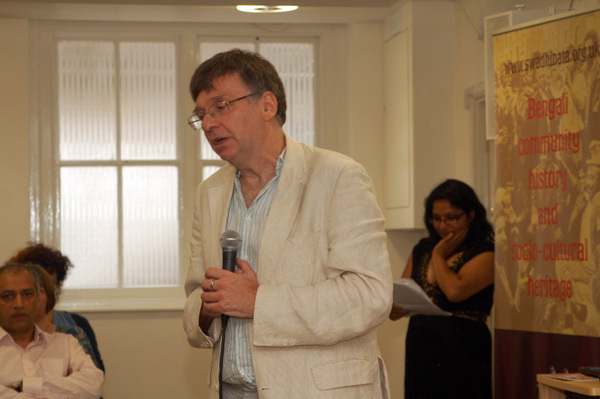 Sean Carey, Centre for Research on Nationalism, Ethnicity and Multiculturalism (CRONEM), Roehampton University. Every attempt has been made by the Swadhinata Trust to secure the appropriate permissions for materials reproduced in this exhibition. If there has been any oversight, we will be happy to rectify the situation and a written submission should be made to the Trust. Text prepared and edited by Ansar Ahmed Ullah, John Eversley & Yasmin Uddin. Panels designed & printed by Fairkey. 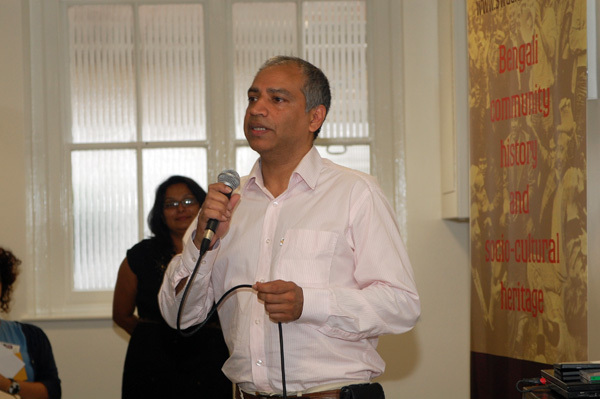 The Swadhinata Trust is delighted to present the touring panel exhibition ‘Bengalis in London’s East End’ which comprises of 10 panels mobile exhibition unlocks the history of Britain’s first Bengali settlers, seamen known as Lascars, and connects key landmarks and buildings associated with the Bengali community in East London. In addition to the exhibition an accompanying book is available, and on request seminar around the local Bengali history can be organised. The exhibition focuses on a wide range of themes of Bengali community including: Beginnings, Settlements of sailors, Settlements in the 1950s, Settlements in the 1950s and The community now – Banglatown. 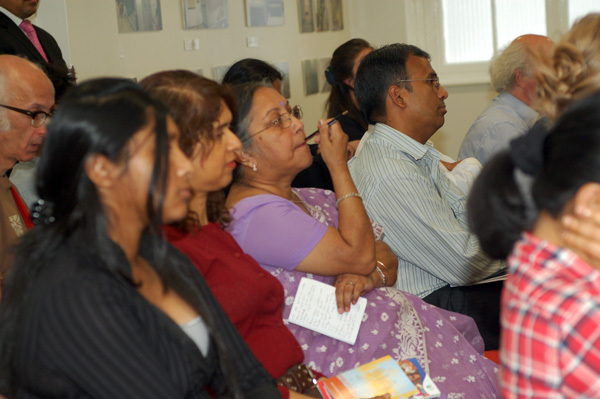 There are approximately 500,000 Bengalis currently living in the UK. Not much history of those Bengalis who settled in the UK currently exists (except two books written by Caroline Adams & Yousuf Chowdhury). Many of the first settlers are now elderly (sadly some have already passed away) and their memories and experiences are being lost as their testimonies have not been recorded and preserved. Many young Bengalis do not know the history of their elders and cannot easily access information related to Bengali community. The project aims to preserve the memories and experiences of the elders before this loss. 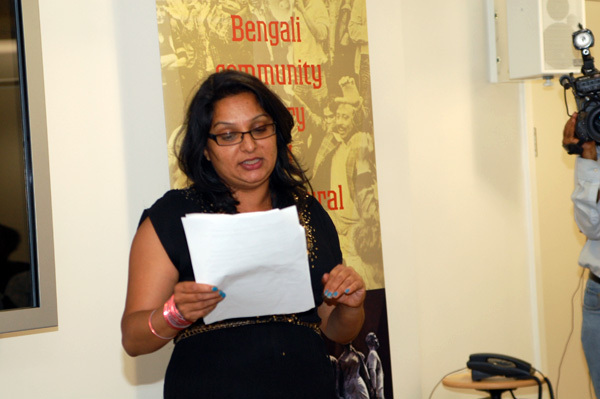 The project will offer unique opportunity to Bengali young people to research, document and celebrate Bengali heritage & history by recording the experience of three generation Bengalis in the UK. Interviews (interviews will be translated into Bengali or vice versa) will be recorded on audio (and if possible on video), materials (including photographs) will be used for exhibition, publication (including learning packs for schools) and website. 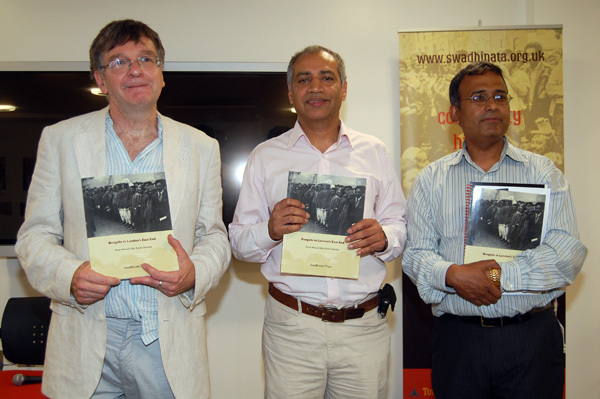 Original material will be held with the Swadhinata Trust (for its proposed Bengali Resource Centre) and CRONEM but copies will be deposited in the Tower Hamlets Local History Library and other institutions Swadhinata Trust works with in partnership. 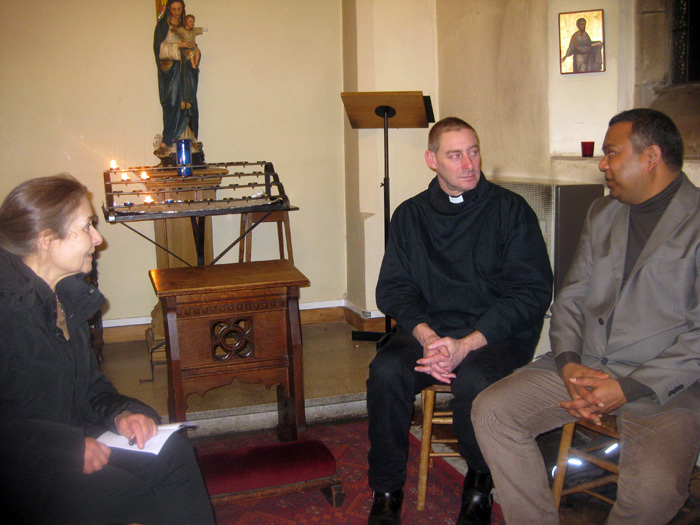 See the short film which includes extracts of the video interviews. Swadhinata’s partner organisation on the Oral History Project. 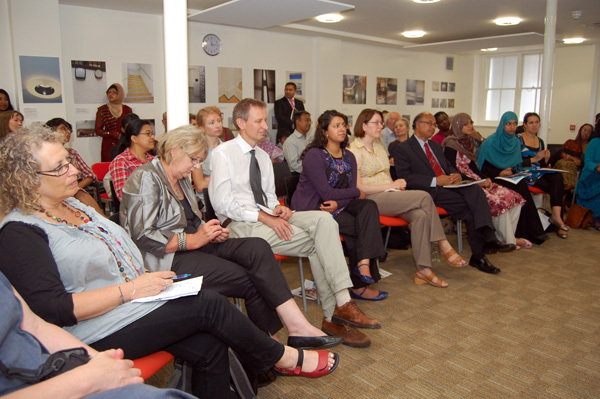 Below is some of the press coverage the Swadhinata Trust’s Oral History Project has received. ►The Immigrants Project – An Oral History Project that tells the stories of people from all over the world who came to settle in Reading. ►Kala Tara An Oral History of the Asian Youth Movements in Britain. ►Kings Cross Voices A London Borough of Camden project which seeks to record people’s memories and unique life experiences of the King’s Cross area. ►Oral histories of Bengalis who experienced Pak army atrocities in 1971 Evidence of Participants & Eye witness accounts. 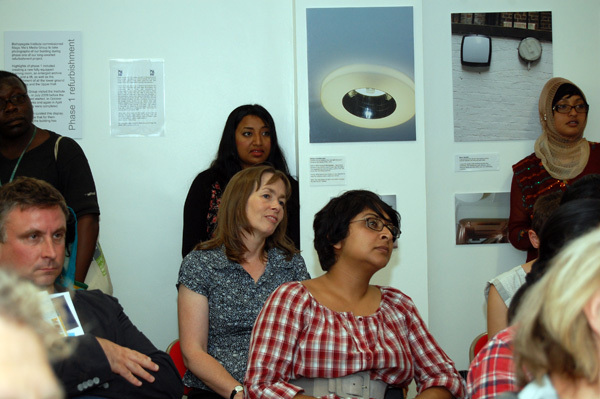 ►B-ONE EKH BENGALI – An intergenerational community oral history project in which young people from the Elephant and Castle area learned interviewing and recording skills and collected the stories of older people in their communities. 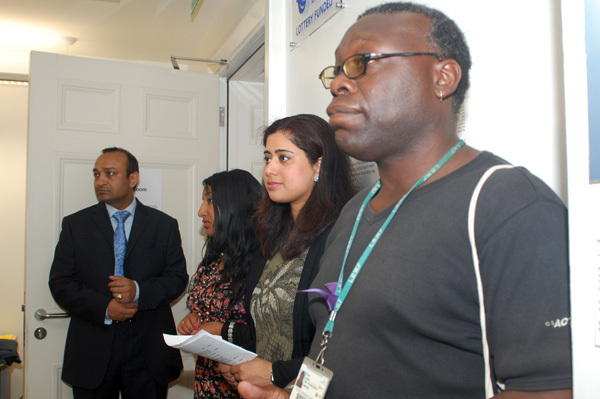 It provided an opportunity for young and older people to make their mark and record their community’s history together. ►Everyday Muslim – a five-year project to create a central archive of Muslim lives, arts, education and cultures from across the UK. 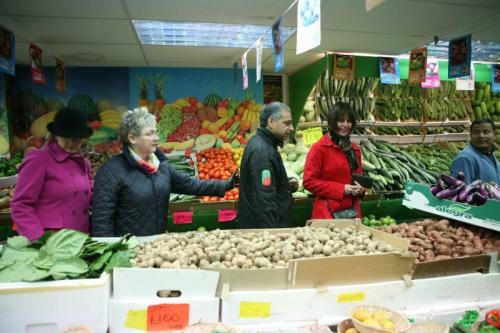 Brick Lane is home to our social enterprise, the Pickle Project. By immersing people in an area with real culture, history and interesting people, we are able to provide unique learning opportunities for companies that want to develop, entertain and inspire people. As well as broadening people’s minds through events and training, the Pickle Project aims to make a real difference to people’s lives through the unique activity of creating a new food brand in one day to sell for the benefit of others. 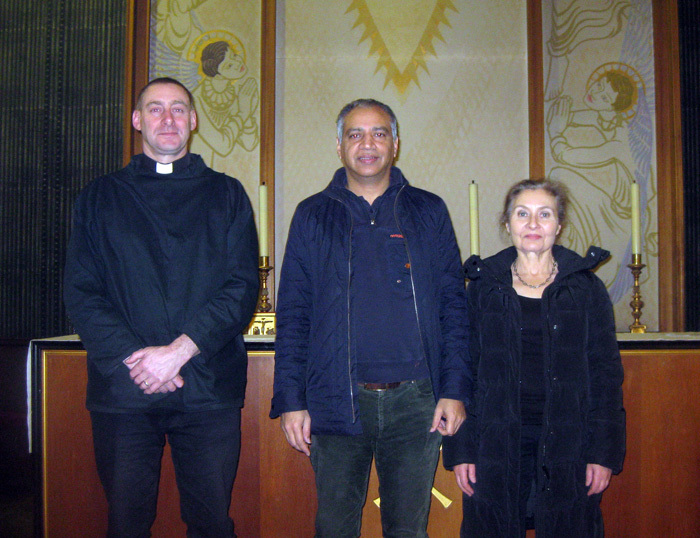 In addition to supporting the local community in Tower Hamlets, we’ve also been raising money to support projects far away in Bangladesh, South Africa and Kenya. If you would like to know more details about the Pickle Project event watch the film at http://www.pickleproject.org/ or see the attached summary. Altyerre Pickle Project: Unilever Event 2nd March 2010 creative learning & development for 80 Unilever staff. Swadhinata Trust was one of the partners with Carnivale Bar, Sheraz restaurant and Sparks Studio. © 2019 Swadhinata Trust Organisation. 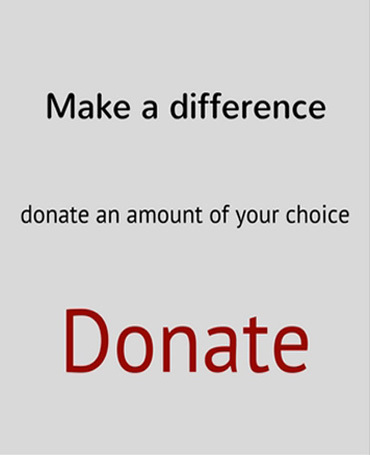 Swadhinata Trust is charity registered with the Charity Commission for England & Wales: 1103890. All Rights Reserved. Design by Mizan.